International concern is growing over the spread of Fusarium wilt, known as Panama disease, as there are fears it could destroy entire countries’ plantations of the Cavendish banana – the most popular and exported variety of the fruit in the world. The destructive fungus, Fusarium oxysporum f.sp. cubense Tropical Race 4, or TR4, had been restricted to five Asian Cavendish producing countries as well as Australia, but has now spread to the Middle East and Mozambique. The fungus blocks water carrying vessels in the plant and produces deadly toxins so that the plant wilts and dies. It also contaminates the soil around the banana plants for several decades meaning that no Cavendish bananas can be grown there until the land is fungus free. While other crops can be grown and some native banana types are immune to the strain, it remains a serious concern to commercial growers where the Cavendish is grown for Western and domestic markets. “Bananas are the world’s most consumed and exported fruit. With 85 percent of all bananas being produced for domestic consumption, you can imagine the impact of this disease of food security and livelihoods in developing countries,” said Fazil Dusunceli, a disease expert with the UN’s Food and Agriculture Organization’s Plant Protection Division, reported the Telegraph. 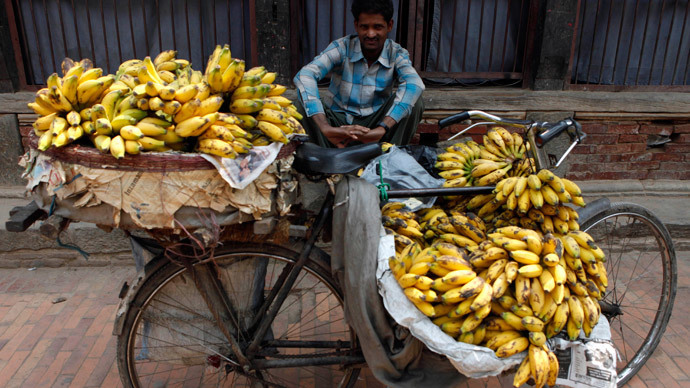 Moreover, the Cavendish subgroup composes the absolute majority of bananas that are traded internationally. In April 2012, an African consortium of international researches and growers met and accumulated their findings in the so-called Stellenbosch Declaration, which aims to curtail the disease as well as raise awareness. The UN’s Food and Agricultural Organization (FAO) along with 30 other organizations has estimated that it will cost $47 million to implement a plan to contain the disease. Altus Viljoen, a plant pathologist at Stellenbosch University in South Africa, says the task ahead is massive: “There are no regulations in place at the moment, no common phytosanitary practices and quarantine systems. We have to build all of this together,” he said, as quoted by the Guardian. The Cavendish banana is popular with growers because of its long “green life” meaning it can be transported by ship. However, cultivated plants, grown by means of vegetative reproduction, do not develop resistance to diseases. In the early 20th century, Panama disease attacked the then-dominant Gros Michel banana variety, which eventually led to the rise of the Cavendish. But it was later proved that the new market favorite was not immune to the disease as well.